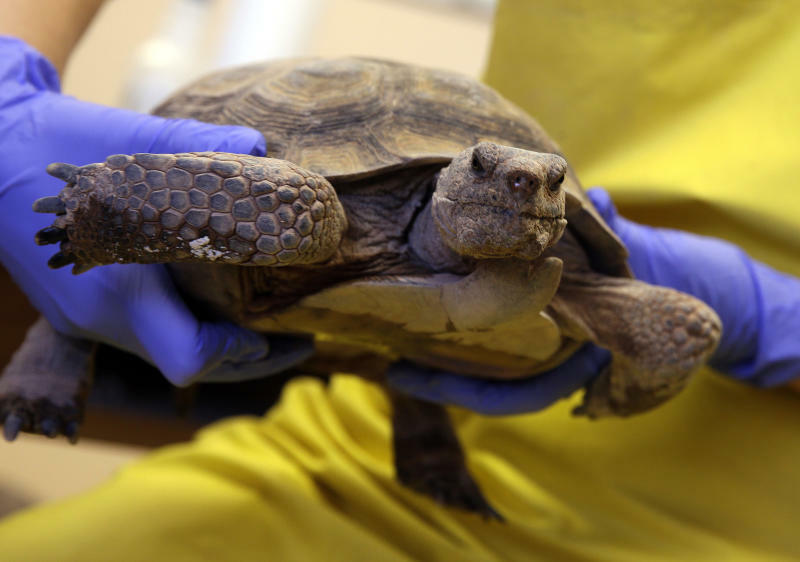 LAS VEGAS (AP) -- For decades, the vulnerable desert tortoise has led a sheltered existence. Federal funds are running out at the Desert Tortoise Conservation Center and officials plan to close the site and euthanize hundreds of the tortoises they've been caring for since the animals were added to the endangered species list in 1990. "It's the lesser of two evils, but it's still evil," said U.S. Fish and Wildlife Service desert tortoise recovery coordinator Roy Averill-Murray during a visit to the soon-to-be-shuttered reserve at the southern edge of the Las Vegas Valley last week. The Bureau of Land Management has paid for the holding and research facility with fees imposed on developers who disturb tortoise habitat on public land. As the housing boom swept through southern Nevada in the 2000s, the tortoise budget swelled. But when the recession hit, the housing market contracted, and the bureau and its local government partners began struggling to meet the center's $1 million annual budget. Housing never fully recovered, and the federal mitigation fee that developers pay has brought in just $290,000 during the past 11 months. Local partners, which collect their own tortoise fees, have pulled out of the project. "With the money going down and more and more tortoises coming in, it never would have added up," said BLM spokeswoman Hillerie Patton. Back at the conservation center, a large refrigerator labeled "carcass freezer" hummed in the desert sun as scientists examined the facility's 1,400 inhabitants to find those hearty enough to release into the wild. Officials expect to euthanize more than half the animals in the coming months in preparation for closure at the end of 2014. The desert tortoise is a survivor that has toddled around the Southwest for 200 million years. But ecologists say the loss of the conservation center represents a harmful blow in southern Nevada for an animal that has held onto some unfortunate evolutionary quirks that impede its coexistence with strip malls, new homes and solar plants. Laws to protect the panicky plodders ban hikers from picking them up, since the animals are likely dehydrate themselves by voiding a year's worth of stored water when handled. When they're moved, they nearly always attempt to trudge back to their burrows, foiling attempts to keep them out of harm's way. They're also beset by respiratory infections and other illnesses. No more than 100,000 tortoises are thought to survive in the habitat where millions once burrowed across parts of Utah, California, Arizona and Nevada. The animals were once so abundant that tourists would scoop them up as souvenirs. Many quickly realized the shy grass-eaters don't make ideal pets. (For one thing, they can live for 100 years.) And once the species was classified as threatened on the endangered species list, people rushed to give them back. Former pets make up the majority of the tortoises at the conservation center, where they spend their days staring down jackrabbits and ducking out of the sun into protective PVC piping tucked into the rocky desert floor. Most of these animals are not suitable for release, either infected with disease or otherwise too feeble to survive. Averill-Murray looks as world-weary as the animals he studies. He wants to save at least the research function of the center and is looking for alternative funding sources. "It's not the most desirable model to fund recovery — on the back of tortoise habitat," he said.